Los Angeles, CALIFORNIA (11 January 2011) – Looking back on 2010, AVID Soccer had an interesting year. It was our first full year of the News site; we added a facebook page to get closer to our readers (and share more pictures); and it was our most profitable year. Still, it wasn’t all good. We lost some significant staff member as players moved on to bigger and better things. As a result, we were not able to publish all that we had hoped. The annual awards, dubbed “The Oscars of Football” by SoccerLens will be up this week. It has been a tremendous year and you might find some surprises in the results. Between staff turnover and our for-profit work, we didn’t get a chance to post the nomination for reader input. So, if you don’t like the results, let us know! World Cup Write-in Contest – With prizes from Nike, adidas, Calle Republic and Reusch, the World Cup contest became the biggest event of the year for AVID Soccer. We received entries from all over the country and there are some spectacular stories out there. It was such a big success that we are making it an annual event. Get your stories and pictures ready and stay tuned for details. facebook – The original idea behind the contest was to launch our facebook page. It worked. We started posting more full high resolution shoots instead of just the scaled back story image. Now we need you to add your comments. Shoot-out – This is always our favorite series and the most read of the year. Unfortunately, we were so busy with some new clients we could only get the boot shoot-out in. The result was a Puma victory with some of the most comfortable boots we have ever tested. Kindle – The hugely popular Amazon Kindle now support AVID Soccer. 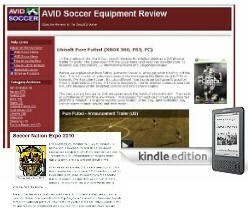 Both the AVID Soccer News and AVID Soccer Equipment Review are available through the Kindle Store. Our Annual Awards should be posted by the end of the week. With no reader input, we had to rely on our test results and comments throughout the year. “I am AVID” Write-in Contest – The rules will be similar to last year requiring an article of 200-500 words and at least one picture. New this year is a picture of you posted to our facebook page holding an “I am AVID” sign. New staff and new authors – Want to be heard? Send us an article and we will review it for posting. Send us several and you might end up with some AVID Soccer gear. 2010 was a great year, but 2011 will be better. If you are in Long Beach in February, look for us trolling the Soccer Nation Expo. The rest of the year, you can find us on pitches all over So Cal. Let us know what you are looking for in 2011.